This '60s-themed hawker centre has the 42-storey high Singapore Flyer as its backdrop and, like VivoCity's Food Republic, uses vintage items like a hawker pushcart, rickshaw and gramophone to give the place a kampong look. 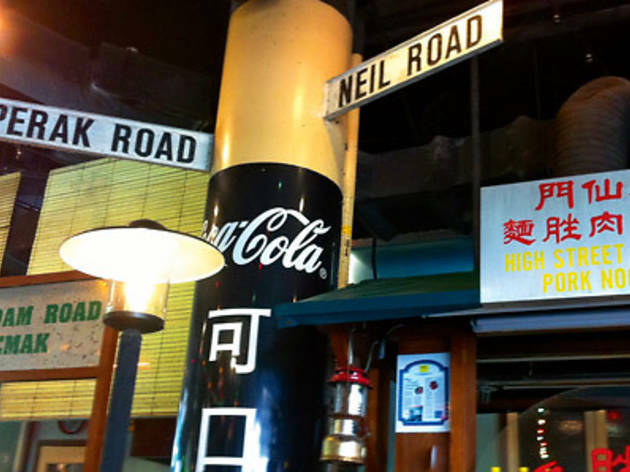 With stalls like Hill Street Tai Wah Pork Noodles, Boon Tat Street Barbeque Seafood, Rong Chen Bak Kut Teh, and Alhambra Padang Satay, it's a great place to bring those hankering for Singaporean dishes. Part of a $10-million plan to boost the attraction’s appeal, the Singapore Food Trail was opened in February 2011 on the ground floor of the Flyer complex. The open-air, 800-seater food centre is intended to invoke the 1960s, with hawker stalls designed as pushcarts and retro decor such as black-and-white road signs plastered onto the walls – as well as a painted movie billboard depicting Bruce Lee’s The Big Boss at the entrance. The heritage theme also comes across in the choice of stalls, with familiar local fare from the past brought in from established hawkers around the island – including several stalls with more than 50 years of history. The Trail has proved popular with tourists, but accordingly, prices are higher than at regular heartland hawker centres, with most dishes starting at $5; locals generally report that dish flavours are generally milder, too. The heritage star of the centre is High Street Tai Wah Pork Noodle (Stall 1), originally located along the Singapore River and dating back to 1939. Their bak chor mee (minced meat noodles, $5/$8) has plenty of supporters who swear the thick, yellow noodles mixed with juicy slices of pork are the island’s best, though many have commented that prices are high (though this is true even at their main Crawford Lane branch). 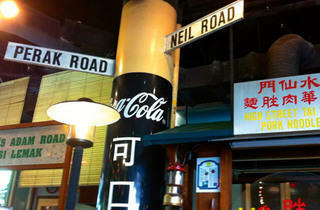 Sin Ming Road Rong Chen Bak Kut Teh, (Stall 8), has been in operation for over 30 years. Their signature pork-rib soup ($5/$8) is known for its strong flavour and thick, juicy ribs – the result of being boiled in water without any added sauces or flavouring. It’s a good bak kut teh for beginners, as it’s less peppery than soups sold elsewhere. Of course, there’s also a chicken rice stall: Bugis Street Famous Hainanese Chicken Rice (Stall 2), another 30-year-old brand, which provides generous portions, including a large crispy drumstick ($5). On the classic seafood side, we’d recommend the Hokkien mee ($5/$8) from Ang Mo Kio Yong Heng Fried Baby Squid Hokkien Mee (Stall 9), which comes with chunks of squid, prawns and chopped fried egg. The broth here is made from midnight the night before and left to simmer for several hours. The fried oyster omelette ($5/$8/$10) by Katong Keah Kee Fried Oysters (Stall 3) is also tasty, with a fine balance of fried eggs and oysters.